In its third campus on Hayes and Van Ness, SI became the premier college on the West Coast, with the greatest enrollment of any Jesuit college and some of the finest scientific equipment and collections found in any university in America. Many consider this the Golden Age of SI, when, it seemed, nothing could diminish the school’s luster. Adding to that sheen were several distinguished alumni, among them John Montgomery ’78, the first person ever to make a successful glider flight. SI students also added to the school’s history when they played rugby against Sacred Heart College in 1893, inaugurating the oldest athletic high school rivalry west of the Rocky Mountains. In 1905, when SI celebrated its 50-year anniversary with grand parties and high Masses, everyone in the community felt on top of the world. They did not know tragedy would befall them one year later. Ask any child in school who invented the airplane, and you’ll hear a chorus of Wright answers. According to the authors of two upcoming books, that answer, and the question prompting it, are both deeply flawed. These authors credit the airplane’s invention to the combined efforts of dozens of early aviators and inventors who toiled for decades on several continents. The better question, they argue, is this: Who made heavier-than-air controlled flight possible? And they have no doubt that John J. Montgomery, a graduate of St. Ignatius College (BA 1879, MS 1880) and a professor at Santa Clara College from 1898 to 1911, flies higher than any other aviator in this regard. Montgomery is all the more significant, the two books argue, as his efforts helped make the early Silicon Valley the epicenter of aviation development in the Western U.S. Despite the historical facts, only a minority of history books make mention of Montgomery, the result of a concerted effort by Orville Wright and the many advocates of the Wright Brothers, according to the authors. In short, the friendly skies haven’t been that friendly to Montgomery’s legacy. Fogel and Harwood aren’t the first to write Montgomery’s biography. The late Rev. Arthur Dunning Spearman, S.J., a former SCU archivist, wrote the seminal biography, John Joseph Montgomery: Father of Basic Aviation, in 1967. In addition, two cousins, John Burdick (SCU ’65) and Bernard Burdick (SCU ’63) are nearly finished with their book, which has the working title The First American Pilot. In July, Harwood was interviewed at the Hiller Aviation Museum and Institute inSan Carlos, which houses several replicas of Montgomery’s gliders. While sitting in a lounge of a 747 on display at the museum (only one of the ironies involving Harwood’s book; the other is that he is a self-proclaimed nervous flier), Harwood told the story of how Montgomery became fascinated by flight. 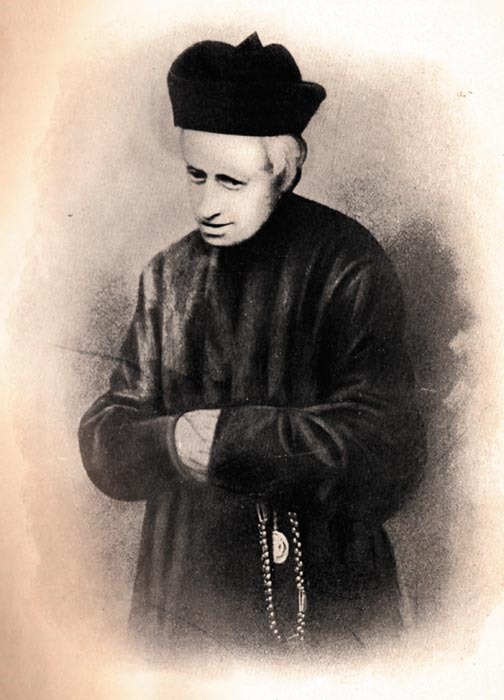 At 16, Montgomery attended the preparatory division (high school) at Santa Clara College (1874–76) to prepare him for St. Ignatius College, where he studied under Fathers Joseph Bayma, S.J., and Joseph Neri, S.J., two gifted and influential educators. After leaving SI, Montgomery worked as a foreman on his family’s farm in the Otay Valley near San Diego, where his fascination with flight led him to study the flights of birds as well as insect wings under a solar microscope. “He would encourage his sisters to chase his grandmother’s geese across the property,” said Harwood. Those experiences led Montgomery to perform years of comprehensive experiments and mathematically formulate theories of how the curved surface of a bird’s wing gave it the lift needed for flight. Given the nearly universal suspicion at the time that anyone building a flying machine must be crazy, Montgomery pursued his glider construction in secret while working on his family’s ranch. He built his own wind tunnel to test the lift of various airfoil shapes, he experimented with “the ratio of wing surface area to lifted weight, and he studied how birds’ wings interacted with air currents,” according to Fogel and Harwood. Some controversy still remains as to the date of Montgomery’s first glider flight. Both Spearman and the Burdicks hold with evidence that points to 1883, while Fogel’s and Harwood’s research has led them to an 1884 date. A dam break in 1916 caused the Lower Otay Reservoir to flood the Otay Valley and wash away important documents that could have resolved the dispute. Both James and John Montgomery often recounted those first flights. The two men went to the Otay Mesa at the edge of the farm, taking along in a hay wagon their disassembled 38-pound wood and fabric glider. Still fearful of ridicule, the two brothers brought rifles so they could pretend to be hunting in case anyone stumbled upon them. The Montgomery brothers pushed their wagon to the edge of the mesa, assembled their gull-winged glider (later named The Gull) and waited for the wind to pick up. When it did, they were ready. James positioned himself a dozen feet below the glider, holding onto a rope attached to its front, and John, at all of 130 pounds, sat inside the glider. When John cried, “Now!” James ran, and John rose 15 feet high and flew for 600 feet. John landed on his feet, holding the 38-pound craft in his arms. All of this happened 20 years before the Wright Brothers flew their plane at Kitty Hawk. This wasn’t the first glider flight in human history. That occurred in 1853 when Sir George Cayley’s coachman took to the skies above England. “The coachman was so frightened by the experience and lack of control that he refused to do it anymore,” said Harwood. Another early pioneer, Louis Mouillard, flew a glider in 1856 that didn’t approach Montgomery’s in terms of stability. That same year, the first controlled flight occurred when Jean Marie Le Bris flew more than 600 feet in France in his glider. The same year as Maloney’s first aerial demonstration, Montgomery filed for a patent, issued the following year, for “Aeroplane,” which would become the basis of lawsuits stretching for years after his death. Among those who praised Maloney’s flight and Montgomery’s glider were Alexander Graham Bell, who claimed that, “all subsequent attempts in aviation must begin with the Montgomery machine,” and Victor Lougheed (half-brother to the founder of Lockheed Aircraft), who called the flight “the greatest single advance” in aviation. The press also praised Montgomery’s achievement and used Montgomery’s term “aeroplane” to refer to the entire craft — the first time the word was widely used to mean more than a part of the machine. For the next three months, Montgomery’s aeronaut flew the Santa Clara in front of large crowds. Tragically, when Maloney repeated the stunt three months later, he failed to see a tangled cable that broke a strut and led to a fatal crash. As he fell, Maloney waved, according to Spearman’s book, “in a kind of farewell” to the crowd below just before the impact. Montgomery continued experimenting with models in wind tunnels, trying to perfect wing design and controls. His final flight came in 1911. Despite his physician’s advice to stay on the ground, Montgomery took a new glider, a monoplane called The Evergreen, named after the region south of San Jose where he and Joseph Vierra made 55 successful flights. He launched it from a rail to gain enough lift to take off. He hoped, at the end of his experiments, to install an engine to give it powered flight. On October 31, 1911, The Evergreen got caught in a whirlwind and crashed, and a stove-bolt in the fuselage frame entered Montgomery’s head behind the ear. He died before help could arrive; he now lies buried in Holy Cross Cemetery in Colma. More than a century of controversy and attempts to discredit Montgomery followed his death. Some attempts to honor Montgomery succeeded (see sidebar) though his widow, Regina, failed in her lawsuits to seek compensation for her late husband’s 1905 patent. A 1912 lawsuit was dismissed and two 1917 lawsuits, one against the Wright-Martin Aircraft Corporation and another against the U.S. government (which had pooled patents to expedite plane production during World War I), both proved unsuccessful. Compounding matters, Orville Wright, in an attempt to secure his legacy, described Montgomery’s accomplishments as “mere aeroplane hobbies” and spread misinformation about the glider designs, according to Quest for Flight. Advocates for the Wright Brothers published that misinformation in the press whenever attempts were made to honor Montgomery. Even as recently as 2005, author Herbert Lockwood published The Montgomery Myth: The Flight That Never Was, citing Orville’s writings. The scope of the task seemed daunting. Then, when documentary filmmakers from the PBS series California Gold approached Harwood and Fogel in 2003 to be interviewed for a piece on Montgomery (a piece that has yet to air), the two men met, discovered their shared passion and formed a friendship. An expert glider enthusiast, Fogel grewup “fascinated with aviation and its history. At an early age, I learned about model gliders and also heard stories of Montgomery’smany accomplishments.” He also wrote about Montgomery for a book called Winds and Wings: The History of Soaring in San Diego, but he felt the section on Montgomery was lacking. Harwood and Fogel finished their book in 2010 and found a publisher, the University of Oklahoma Press, with a reputation for producing noteworthy histories of California. In the intervening years, he found many answers to those questions, which he shared with an audience at SCU in February 2012 as part of the School of Engineering’s centennial celebration. It’s that feeling, one of freedom and exhilaration, the stuff of legend and flights of fancy, for which Fogel, and all of us, can thank Montgomery. 1920: San Francisco renames the Marina Flying Field the Montgomery Field. 1924: SCU establishes the Montgomery Laboratories on the site of the present-day Mayer Theatre. 1934: SCU holds a celebration to commemorate the 50th anniversary of Montgomery’s first flight. 1943: Disney features Montgomery in an animated movie called History of Aviation. 1940s: A number of San Diego organizations undertake efforts to form a memorial committee, establish the Montgomery Trophy for a soaring contest, construct a Montgomery Memorial at Otay Mesa and rename the Gibbs Flying Field to Montgomery Field. 1946: Columbia Pictures releases Gallant Journey, a movie about Montgomery, starring Glenn Ford. 1946: The John J. Montgomery Elementary School opens in Chula Vista; SCU constructs the memorial obelisk to commemorate the 1905 Maloney flight. 1960s: A group of aeronautical engineers from Lockheed construct a replica of The Evergreen; Santa Clara County establishes a monument on the Evergreen site; the National Society of Aerospace Professionals creates the John J. Montgomery Award; Montgomery inducted into National Aviation Hall of Fame; Spearman book published. 1970s: The first Montgomery Meet, a hang gliding competition, is held outside San Diego; John J. Montgomery Elementary School is completed and dedicated in San Jose’s Evergreen district; the U.S. Air Force Auxiliary Civil Air Patrol Squadron 36, based in San Jose, is named the John J. Montgomery Memorial Cadet Squadron; the Experimental Aircraft Association establishes the John J. Montgomery Chapter. 1990s to date: Santa Clara makes the Montgomery home an historical landmark; Montgomery’s first glider is recognized as an International Historic Mechanical Engineering Landmark by the ASME; Norman Mineta reads into the Congressional Record an address commemorating the 70th anniversary of Maloney’s 1905 flight; Montgomery is inducted into the U.S. Soaring Hall of Fame; Montgomery is honored at the Centennial Celebration of Soaring Flight in 2005 in Aptos; a 30-foot-tall steel sculpture is dedicated in 2008 in the Evergreen district; that same year, the Hiller Aviation Museum in San Carlos celebrated the 125th anniversary of Montgomery’s first flight; in 2011, SCU’s School of Engineering and ASME establish a $40,000 endowment fund for the John Joseph Montgomery Gold Medal. Students went on vacation January 21, 1880, but most returned the next day to help move furniture from the old school on Market Street to the new school on Van Ness Avenue. 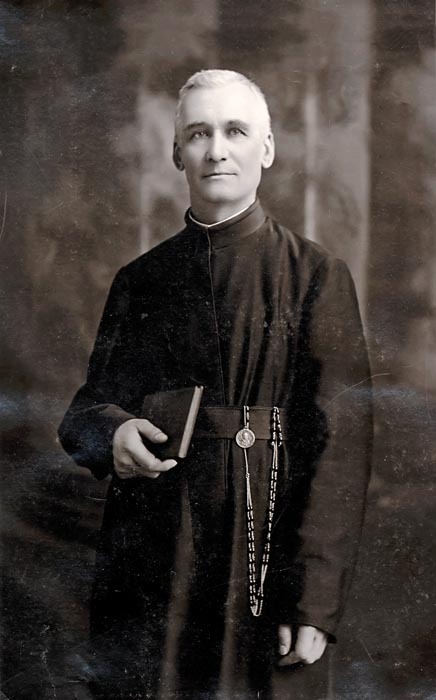 Bouchard preached his last sermon January 25 in the church that for years had existed on the second floor of the old school, and on January 31, the SI Jesuits heard confessions there for the last time. Those same priests were on hand for the February 1 dedication of the new Hayes Street Church, presided over by Archbishop Alemany and Bishop James A. Healy who delivered the homily before nearly 7,000 people, only half of whom could fit inside the church. Those who could not fit stayed outside during the Mass. By the end of the day, 15,000 people visited the church and school buildings. That year, the church again drew massive crowds on September 19 upon the death of President James Garfield, who had been shot July 2 by an attorney angered that he had been denied a consular post. At the September 26 Solemn High Mass in memory of Garfield, Fr. Kenna eulogized the president and warned parents “concerning the evils that flow from a lack of respect for authority, especially in the young.”12 As with Lincoln’s assassination, the Jesuits draped their school in black for this sad occasion. For the march commemorating Garfield that day, 500 of the SI student body walked from Grove Street to Market Street. After waiting for two hours, they learned that the Industrial School Band was to lead their part of the parade. The boys grew angry, having imagined that they would be at the head of the procession and fearful that people might confuse the two groups. They threatened not to march, but the Jesuits persuaded them not to cause trouble on this solemn occasion. “No sane mind would mistake them for boys from the [Industrial School] reformatory,” they argued, and the students agreed to follow the band. Imoda turned the administration of the college over to Fr. Edward Allen, SJ, in 1893, and he would lead the school for three years. Imoda, the head of the California Mission, believed the college could support itself without tuition from college students enrolled in the “classical course” (meaning those in the grammar, literary and historical departments who had added Latin and Greek to their studies). The Jesuits, hearkening back to their traditional European roots, also decided only to award degrees to students taking this classical course; thus, despite the free tuition, enrollment went down when the 1893 term began. In 1896, the experiment with free tuition ended, due in large part to the school’s enormous debt. The Jesuits once again charged tuition, with college students paying $8 a month and another $10 to receive an academic degree. High school students paid $5 monthly while sixth through eighth graders paid $3. San Francisco Chronicle writer Will Connolly ’28, in the November 4, 1949, edition, wrote about that first game in an interview with Warren White ’39, an English teacher at SI at the time who had researched the history of the rivalry. He told Connolly that the game began when Cornelius Kennedy, a Sacred Heart College student, “bought a pamphlet on ‘How to Play Football,’ written by a young man under the style of Amos Alonzo Stagg. Kennedy collected a team at Sacred Heart and elected himself coach and captain because he owned the textbook and the football. He had an investment of $12 and needed competition to protect it. So he visited St. Ignatius and cajoled the boys into fielding a team. Kennedy was magnanimous. St. Ignatius had no coach, no team. He generously agreed to teach them the fundamentals gleaned from the Stagg book. For two weeks he tutored the Ignatians late in the day, after putting in licks with his own Sacred Heart eleven. “The game was played on March 17, which is St. Patrick’s Day and a holiday for the schools…. The game was held in Central Park at Eighth and Market streets where the Crystal Palace now stands. Fifty-seven years ago, the corner was on the outer fringe of the downtown district, virtually in the sticks. Both Sacred Heart and St. Ignatius had to practice surreptitiously, for the Brothers and the Jesuits considered football a brutalizing sport at that time and a distraction from scholarly pursuits. The way it was played, they were right. Injuries were common. In 1896, Fr. 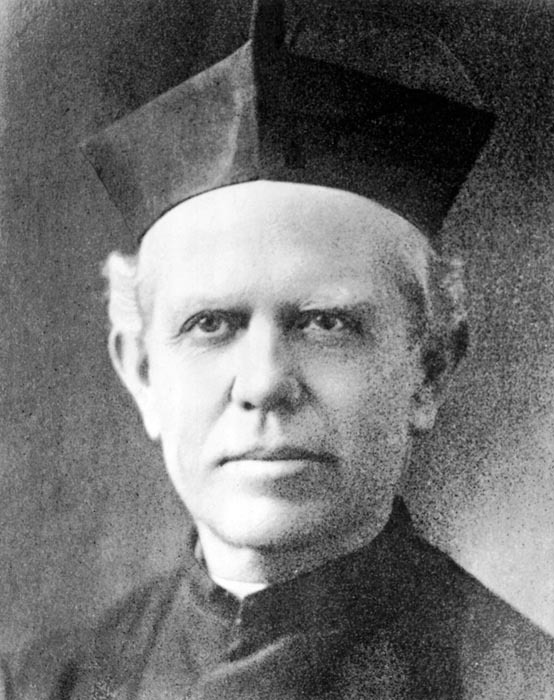 John P. Frieden, SJ, succeeded Allen as president, and he served for the next dozen years, leading SI through the triumph of its 50th anniversary celebration and through the tragedy of the destruction of the school and church in the Great San Francisco Earthquake and Fire of 1906. Born in Luxemburg, Frieden had worked as a teacher even before entering college. He entered the Society of Jesus after completing his college work and, while still a novice, traveled to Missouri where he taught at St. Louis University. After several other assignments, he became president of Detroit College in 1885 and, in 1889, head of the Missouri Province. He trained novices before his appointment to SI. Even before Frieden came to SI, most of the Jesuits who were involved with the founding of the school were in failing health or had died. On March 18, 1897, Maraschi, SI’s founder, died, and his body was borne to the Gentlemen’s Sodality chapel. As the school’s founder, first president and treasurer, he had come into contact with thousands of San Franciscans who knew and loved him for his charity. As a testament to how many people loved Maraschi, “a continuous stream of people commenced moving along the line of Hayes Street toward St. Ignatius Church, growing more dense” as more people joined the throngs coming to mourn the late, great priest.17 Even the Southern Pacific Railroad Company transported his body to Santa Clara for burial at no charge. Fortunately for the Society of Jesus, just as it was losing members of the old guard to death, young men were entering its ranks. One such Jesuit, George P. Butler, was ordained a priest in June 1897, the first SI alumnus of the Van Ness campus to have that distinction. During this period, the school stopped offering classes for elementary students as the Jesuits attempted to solidify the school’s reputation as a world-class school of higher learning and as more and more parishes opened their own grammar schools. As a result, enrollment fell; “it was hoped, however, that the raising of the standard of the college would more than compensate for any numerical loss.”19 The school still struggled to repay its debts, and by 1899 it re-established the Ignatian Society, friends of the school who had earlier provided the school with financial assistance. That same year, Mrs. Regina Pescia created what may be the college’s first named scholarship in honor of her husband, Dr. Joseph Pescia. The scholarship provided a student with an annual gift of $130 for four years. Students competed for this academic honor, and its first recipient was Owen McCann. Young Owen was not the only financial beneficiary that year. The East Bay land near Richmond that Maraschi had purchased in the 1870s, and adjacent parcels that he had acquired over the years, had grown in value as they were near the Santa Fe line and Standard Oil’s property. The Jesuits sold the land for $200,000 in 1901, and for the first time in its history, the school was out of debt. The Jesuits thanked the donors of the Ignatian Society and disbanded this organization. They looked to the new century with confidence and, for the first time, with solvency. The first years of the new century proved to be propitious ones for the school’s drama program. Students staged Macbeth in January 1900, and Julius Caesar a year later. In 1903, they performed Richard III and, in 1905, Henry V. The school also experimented with its classical program by introducing, in 1902, practical business courses such as bookkeeping and stenography at no extra cost to students. Also, as part of their commitment to mens sana in corpore sano (a sound mind in a sound body), the Jesuits strengthened their athletic program in 1902 by building two handball courts and, in 1903, a $40,000 gymnasium for use by students and members of the Gentlemen’s Sodality. Riordan writes that “on February 2, 1903, after assisting at Mass, the students repaired to the college lot on Franklin Street, there to assist at the beginning of the work.”21 This use of student labor by the Jesuits was typical for its day. The 10,000-square-foot gym contained handball courts, a billiard room, a reading room, a bowling alley, a 50x15-foot plunge bath, a boxing ring, gymnastic equipment, a locker room and a running course on the upper level of the 35-foot-tall structure. To prepare for the 50-year celebration, 130 members of the Alumni Association gathered at the Palace Hotel on October 8, 1903, just a few blocks down the street from the site of the first SI. Others gathered to celebrate, too, though in an unusual place. In the basement of SI college, the women members of the Francesca Society (named in honor of St. Frances of Rome), had set up a free school for 240 girls to teach them sewing and cooking. During Christmas 1903, the teachers and Jesuits distributed presents to the girls and gave them a tree to decorate. The jubilee year of 1905 began with an announcement that the school term would, from this year forward, begin in September and end in June. The Archbishop made this request to encourage uniformity among the schools and colleges in the archdiocese. The Jesuits also announced that no diplomas would be conferred during the May commencement exercises that year; instead, graduates would receive them in October during the Jubilee celebration. SI, in its jubilee year, was at the pinnacle of its success. It was one of the key centers for San Francisco Catholics who sought to study and worship. It attracted thousands to the various missions and retreats by visiting Jesuits. The famed preacher and future principal of St. Ignatius High School, Fr. Dennis Kavanagh, SJ, wrote the following in an article appearing in the St. Ignatius Church Calendar (an expanded church bulletin, published monthly for 70 years): “Perhaps the most striking features of St. Ignatius Church were the solemn services for which it was noted. Who does not recall the male choir of 50 voices under the masterful direction of Fr. Allen and Fr. Coltelli? Who does not remember the solemn occasions like the feast of Corpus Christi when 1,600 sodalists, decorated with medal and badge, moved in solemn procession through the aisles? Who does not know how, on days like Good Friday, the church was filled to overflowing two hours before the services began? The school began the weeklong jubilee festivities on October 15, 1905, with a Pontifical Mass of Thanksgiving at St. Ignatius Church celebrated by Coadjutor Archbishop George Montgomery of San Francisco. Many other celebrations and Masses followed and the alumni gathered on the Tuesday of that week. The next day, the Alumni Association took many of the visiting Jesuits, who had come to SI for the celebration, on a San Francisco Bay cruise and, on the following day, to the top of Mt. Tamalpais on the old railroad line that wound its way to the peak. That Thursday, October 19, the school celebrated with a gala banquet at the St. Francis Hotel, attended by 175 priests, alumni, faculty and friends of the school. The Hon. W. Bourke Cockran, a Congressman from New York and noted orator, was the featured speaker. Judge Jeremiah Sullivan, the first president of the Alumni Association, offered these opening remarks: “Any American citizen who overlooks the portals of the Golden Gate can find much to gratify him both as an American and a Catholic. As he looks out upon the sea, he reflects that, for over 800 miles, it washes the shore of his beloved California. When he looks back on old Yerba Buena, where the Franciscan friars made their first home, he reflects on the wonderful growth of San Francisco. He looks back to the early days of the city where, closely following the discovery of gold, came the followers of Loyola, — there they laid the foundation of the great institution of learning whose fiftieth anniversary we celebrate tonight.”24 The next day, October 20, the Jesuits held a special commencement ceremony where they awarded nine Master’s and Bachelor’s degrees and 16 honorary degrees. In Brokers of Culture: Italian Jesuits in the American West 1848–1919, the author, Rev. Gerald McKevitt, S.J., of Santa Clara University, writes, in part, of the tensions in the late 1800s at SI between teachers who believed in the European model of a classical education (such as Rev. 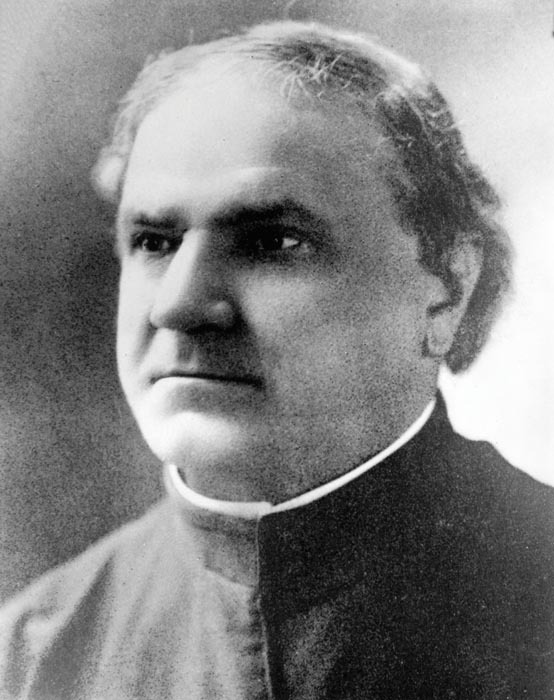 Enrico Imoda, S.J., who served as SI president between 1887 and 1893) and others — McKevitt calls them “Americanists” — who believed in a modern system that favored practical courses such as bookkeeping and mineralogy. Foremost among these Americanists, ironically, was the Italian Jesuit Luigi Varsi, S.J., who served as president of Santa Clara College and Superior of the California Jesuit Mission. The chapter, below, from McKevitt’s book, offers insight into this pivotal point in SI’s history. by Rev. Gerald McKevitt, S.J. If there was one aspect of Jesuit education that conservatives hoped to upgrade, it was its quality. Even liberals conceded that admission standards at the colleges had slipped. For the first time in decades, the California schools faced stiff competition from public institutions whose modern campuses, lower tuition and diverse curricula siphoned students by the thousands. Faced with an imperative need to improve, Americanists counseled compromise and patience lest the schools drive away their clientele. But conservative Europeans demanded immediate reform, which, they reasoned, meant a restoration of the ancient languages. Everyone recognized that Latin and Greek studies had declined. Even at Santa Clara, the order’s flagship college in the West, four times as many graduates took the Bachelor of Science degree as the classical Bachelor of Arts. Preference for a more vocational and utilitarian course of studies was not confined to the western states. In response to rapid industrial development, American education itself was moving away from the classical tradition. Of the nearly 6,000 students attending Jesuit colleges across the United States at this time, less than 2 percent graduated with the Bachelor of Arts degree in the classics. Woods’s caveats were spurned. Offered an escape from the cul-de-sac created by a rigid curriculum, conservative Jesuits from the Piedmont region of Italy refused to budge. In this, they were backed by stewards in Europe. Alarmed at the unraveling of classical studies, they waged a campaign to restore Latin and Greek. Rev. Nicholas Congiato, S.J. (SI president for much of the 1860s) writing to Rome in 1884, announced that the classics had been “almost abandoned by everyone.” Responding to the alarm, Father General Anderledy ordered the Californians to do all that they could to rehabilitate traditional studies. Although Robert Kenna (left) of Santa Clara countered that Congiato exaggerated, the president had no choice but to comply with Rome’s mandate. Kenna’s laments were disregarded, however. Higher ups refused to budge, and, as predicted, enrollments persisted in their downward slide. Educational practices whose efficacy had been taken for granted for generations were indeed becoming outdated. But too few Jesuit authorities perceived either the need for change or the way in which change might be accomplished within the context of their tradition. The order’s mantra about adapting to times, places and persons did not, it seemed, enjoy universal acceptance. Student discipline further polarized Jesuits. The old European system of strict surveillance and faculty control frustrated teachers and pupils alike. “The only difference between Santa Clara and any other prison,” quipped one alumnus, “was that classes instead of a stone quarry brought a student out of his cell for a considerable period each day.… The college rules prohibited everything but study,” he groused, “and, once enrolled, the festive young student might as well have been waiting for the [electric] chair.” Traditionalists nevertheless insisted on adhering to European conventions. During his tenure at St. Ignatius College, Enrico Imoda forbade card playing, smoking, boxing and similar breaches of discipline. 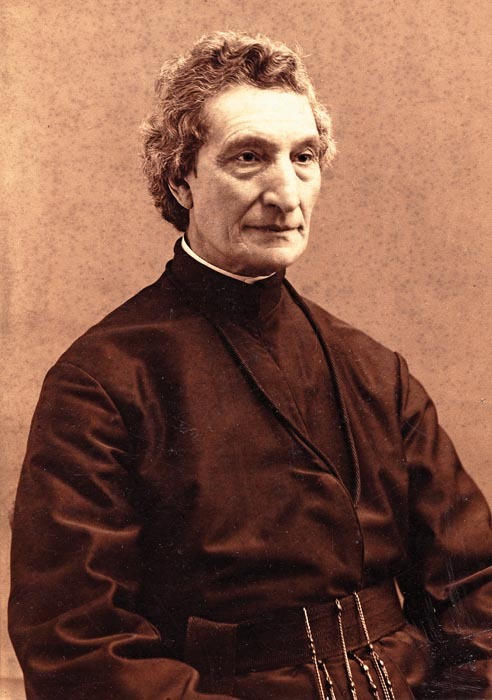 When the Americanizing Luigi Varsi “allowed the boys to be taught round dances” at Santa Clara — “we must adapt ourselves to the ideas of the country,” he said — Jesuit rigorists were scandalized. Still more ink was spilled over money matters, particularly in San Francisco where the Jesuits had fallen into a sink hole of debt in the construction of a new St. Ignatius College. By 1888, liability had grown to $1,008,511, a figure roughly equivalent to 18 times that amount today. Americans criticized the bookkeeping of septuagenarian Antonio Maraschi (left), the College’s founder and for decades the treasurer of the California Mission. Even Roman authorities feared the failing priest was embroiled in risky transactions that endangered the financial security of the entire Mission. “If there were a sudden failure,” Superior General Anderledy warned, “we would probably be entangled in all manner of law suits.” Visitor Rudolph J. Meyer too had urged more diligent bookkeeping during his inspection tour in 1889. Unable to hammer out their differences on so many issues, turn-of-the-century Jesuits ricocheted from one crisis to the next, their effectiveness blunted by the disparities that divided them. By the time Enrico Imoda’s term drew to a close in 1896, the chasm of disagreements had so widened and deepened that even former cheerleaders conceded the reclusive superior and his coterie had done “great damage” to operations in California. In a startling about-face, Domenico Giacobbi said that Imoda’s “diffidence and sharp manner” left scarcely no one unalienated. Instead of uniting personnel in opposition to himself, his arbitrary rule had exasperated divisions. Frieden attempted to chart a new course by appointing progressives to positions of authority. But his cranky personality and reversal of long-standing practices inevitably antagonized the old guard, prompting alarmists like Cichi to declare that “Father Frieden and his Irish consultors had destroyed the Mission.” Meanwhile, Americanizers cheered his reforms. And his firm-handed leadership during the San Francisco Earthquake and Fire of 1906, which destroyed St. Ignatius College, won him many admirers. But when time came to find a successor, the old conundrum reappeared. Whom to appoint? “There is no one in California that could in the near future govern the Mission,” Frieden himself advised Rome. However, if the General was willing to merge the Rocky Mountain and California missions — a plan that had been under consideration for several years — a solution was at hand. There was an experienced administrator in Oregon, Frieden recounted, who could fill the bill. Thus it was that the two jurisdictions were reunited, and Georges de la Motte, a 46-year-old wunderkind from Alsace and eminent alumnus of Woodstock College, became head of Jesuit operations on the West Coast. A man of uncommon intelligence and culture, this highly respected missionary was well equipped for his new role. As restrained and diplomatic as Frieden was blunt and imperious, De la Motte integrated the two missionary jurisdictions and calmed the dyspeptic Californians, a task eased by attrition through death of some of the old guard. At the same time, he tackled a set of challenges unique to the Rocky Mountain Mission. If you are interested in purchasing Brokers of Culture to learn more about Jesuits in the West,go to Stanford University Press’s website or to the Jesuit Retreat Center bookstore in Los Altos. James J. Corbett, known as Gentleman Jim to boxing fans, became World Heavyweight Champion by knocking out John L. Sullivan. Corbett later earned entry in the International Boxing Hall of Fame. In 1880, when the famed boxer Gentleman Jim Corbett was only 14 and a freshman at the high school division of St. Ignatius College, he twice fought an older student, John Carney. As a result, the Jesuits expelled him. He finished his high school career at Sacred Heart before going on to boxing fame. Carney was later charged with murder in 1898 after a fatal brawl. We first heard about Corbett’s time at SI from Mike Nerney, who was researching Carney, Nerney’s ancestor and Corbett’s opponent. Here is his story, taken from Corbett’s book The Roar of the Crowd, published in 1925. From my first fight I started to run away. This scrap came at an early age, when I was about  years old. I was attending St. Ignatius College in San Francisco, and at noon and recess periods was confined to what they called the “Little Yard.” Up to a certain grade you were in the “Little Yard” with the smaller youngsters, and when you were promoted out of the “Little Yard” you could go in the “Big Yard” with the big boys; but I was always large for my age and looked much older than I really was, so I would go to the picnics and they would have prizes for boys under 12 years old, and they would never let me try for them, and I felt rather out of it and often lonely, so whenever I could I would sneak in the “Big Yard” at lunch times to play hand ball and prisoners’ base with the older boys. The bully of the “Big Yard” was a boy called “Fatty” Carney, but I had never been warned about him. Now about this time, I struck up an acquaintance with a fellow by the name of Hopkins. We used to bring our own lunches, as we lived quite a distance from the school, and this Hopkins boy, whose folks were well-to-do, brought all the finest kinds of cakes and sandwiches. Perhaps this was one of the attractions of the friendship. Anyway, I used to go in and play with him and get some of his lunch, which was much finer than anything I had ever had. In playing prisoners’ base one day, I happened to chase him, and “Fatty” Carney, the bully I have just spoken of, was running after someone else, and Hopkins ran into “Fatty” and Carney promptly hit him. Of course I took Hopkins’ part, as he was my “pal,” and grabbed Carney’s arms and started to fight him then and there, but the other boys interfered and a Brother of the College came and ordered me back to the “Little Yard” where I belonged, but not before Carney had said, “I’ll get you after school!” Someone was then kind enough to inform me that I was up against the toughest fellow in the school. We went around to a lot opposite the United States Mint, called the “Mint Yard,” and the whole school followed. We started to fight. He was a big, strong fellow. If we had been men and in a regular ring, they would have called him the slugger and me a panther, terms much used in descriptions of fights those days. I had never had a boxing lesson, but occasionally had watched my older brother box. He was six years older than I, and I remembered a few of his tricks, such as looking at the stomach and hitting in the face, just the crude principles of the boxing art. “Fatty” started to rush me, and as he was stronger and older than I, I began to jump out of his way, trying to make him miss. Then I’d jab at him and jump away, instinctively using my head even at that age, though I didn’t realize it myself. After a few minutes, the police came and scattered us, but by that time I was sure I could whip “Fatty,” and when we ran away from the police, I ran in the same direction that he took, as I wanted to have it out with him. He made for his home, and we came to the “Circus Lot,” used for the circus performances in those days. I had no supporters with me, just two or three of the boys of my own neighborhood who had followed me, while “Fatty” had his whole gang at his back. We started fighting in this lot and I was getting the better of him, and he realized it, so he grabbed hold of me and started to wrestle, and, being much stronger than I, threw me down and proceeded to punch me while I lay underneath him. An old gentleman with a cane stood near, watching us. He took the cane in his hand and stepped in and hit “Fatty” on the back with it and told him he ought to fight boys of his own age and size. I went home with a black eye. I explained the circumstances to him and told him it had been a case of either fighting or running away and being called a coward. I didn’t realize at the time that my father was really proud of me because I had not chosen the other entrance of the school. He asked me who it was I had fought with, and I told him “Fatty” Carney. “Carney down on Howard Street?” he asked. In those days San Francisco wasn’t as big as it is now, and everybody knew everybody else, and he repeated, “Carney down on Howard Street? H’m! What d’ye think uv that!” He seemed surprised to think that I had been fighting with this big Carney boy and couldn’t understand it. I was surprised and pleased, but the wind was taken out of my sails when the head of the College appeared and put us both out of school. He did not suspend us, but expelled us for good. Anyway, this fight grew to be a legend, a sort of historical event in the school, and was talked of long afterwards, so the boys told me. From that fight I learned a lesson that has lasted me all my life: that the size of a man does not count, and that by using my head and feet I could lick a man much stronger than myself.